Two little gems from Chavez, in case some of you still manage to have doubts about what creep we are facing. Two little things that taken together give you the real measure of the guy. “no les vamos a permitir gobernar otra vez. No pueden gobernar este país y no se lo vamos a permitir porque sería el desastre más grande”. We are not going to let them rule again. They cannot rule this country and we are not going to allow it because it would be the greatest disaster. You will convene with me that the two items go well together to establish once and for all that the president of Venezuela is a megalomaniac psychopath who has not reached his natural course of horror because, well, we are not in the 1930ies anymore, nor a Caribbean island..... but the potential is there, give him time. When Chavez killed hundreds to takeover the government, a large segment of the population clapped and praised him, now they are ringing their hands. When you give a killer a free pass, he takes it as a license to kill. 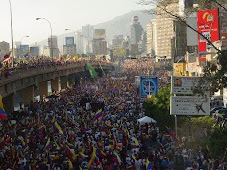 I say the Venezuelan people are paying a penance for their infatuation withe demigods. Yes, it is important to remind everyone of the nature of the regime in Caracas, much like the unchanging nature of the beast in Havana. Tonight, in Jakarta, Ross's Right Angle blog has posted one of Fontova's excellent pieces on Castro's hellish healthcare system. "Pathocracy is a disease of great social movements followed by entire societies, nations, and empires. In the course of human history, it has affected social, political, and religious movements as well as the accompanying ideologies and turned them into caricatures of themselves. This occurred as a result of the participation of pathological agents in a pathodynamically similar process. That explains why all the pathocracies of the world are, and have been, so similar in their essential properties. Identifying these phenomena through history and properly qualifying them according to their true nature and contents - not according to the ideology in question, which succumbed to the process of caricaturization - is a job for historians. Just posted something similar...even the mention of Stalin! Keep up the good work. But I continue to read when I can - been busy trying to keep my company afloat with a socialist US President in power too. Funny, but when I read this post I immedaitely thought of Obama constantly telling Americans that we 'cannot return to the failed policies of the past'. He doesn't have the power Chavez does - and for that we can thank Divine Providence and the Founding Fathers. But we cannot take much more of this 21st Century Socialism in the USA either. "We are sure of the extraordinary success she will have at the helm of Agropatria based on her previous experience. Of course, the way chavismo defines success is not necessarily the way intelligent and rational people define it." Chavismo defines success as getting anything out of the hands of anyone who opposes Chavez, and subjecting it to Hugo's whims. By that definition, they have already succeeded with Agroisleña. Nothing that comes later will play into their perception of success or failure. They have succeeded, therefore there is no failure.